Uber pays drivers in Australia less than the minimum wage on average, according to a study by economist Jim Stanford. Stanford simulated Uber fares across six Australian cities and pegged average driver earnings after costs at $14.62, below the minimum wage of $18.29. Stanford concluded that Uber’s drivers were effectively subsidising the company by making less than their industry peers. The Australian study comes after an MIT paper claimed Uber and Lyft pay drivers less than $US4 an hour in the US – but Uber successfully disputed the findings. Uber can’t get away from academic studies criticising how little it pays drivers. The study, conducted by economist Jim Stanford at the Australia Institute’s Centre for Future Work, found that the average Uber wage in Australia came to $14.62 (£8.23, $US11.42) per hour, well below the national minimum wage of $18.29 (£10.30, $US14.29) per hour. That’s the estimated money drivers take home after deducting Uber’s fees, net taxes, and vehicle maintenance costs from their gross hourly earnings, according to Stanford. The figure only applies to UberX, Uber’s cheapest and most popular service, and the study simulated fares across six Australian cities. Stanford calculated that waged drivers earned a weighted average of more than $30 per hour. 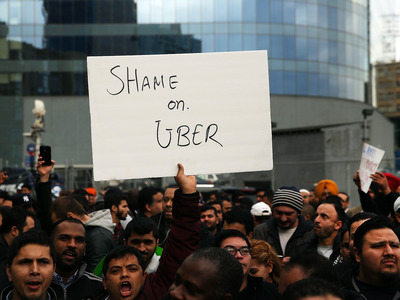 “By this benchmark, UberX drivers are underpaid by $15.50 [£8.73, $US12.12] per hour,” he wrote. Normal taxis cost anything between 27% and 60% more than UberX in Australia, according to Stanford. If Uber paid its drivers properly, it might become just as expensive, though. Stanford called on Australian politicians to investigate Uber’s fares and create new regulations to protect drivers. Uber has not responded to a request for comment. The Australian study follows a similar paper from MIT in the US which found almost three-quarters of drivers working for Uber and its rival Lyft earned less than minimum wage. The MIT study relied on data from a survey of more than 1,100 ride-hailing drivers, and found their median pre-tax profit was $US3.37 (£2.43) per hour. But Uber brought out its in-house economist to pick holes in the study – though the firm didn’t openly volunteer its own pay data – and asked that MIT revisit the study. The researcher, Stephen Zoepf, agreed and recalculated median profit at between $US8.55 and $US10 (£6.16 and £7.21) an hour. Academics are only now making official what Uber drivers have been complaining about for years: that the firm keeps fares artificially low in order to undercut taxis. Last February, British Uber driver David Dunn complained to UK politicians that he couldn’t make back his costs on a £37,000 Mercedes while driving for Uber’s more expensive “Exec” service. Another driver complained he had to work up to 90 hours a week just to break even.